We poured over 11,500 yards of Golf cart paths and over 3000 cu. Yards of cast in place water features at the prestigious Trump International Golf Club in Palm Beach, Florida. Our decorative mixes required precise slumps and critical placement. The advantage of our all wheel drive front discharge trucks and exceptional delivery professionals allow us to commit to specialty projects such as this. 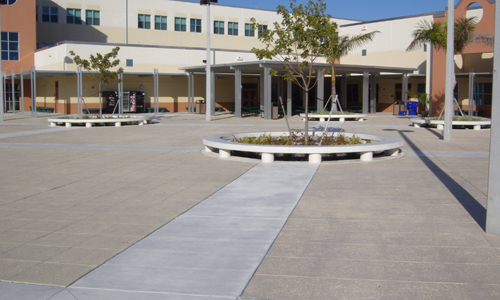 As part of a newly constructed campus, the Sun coast Community High School incorporated an open courtyard with decorative and colored concrete. When called upon for specialty decorative concrete work, Wm. Adeimy Jr Inc. is one of South Florida’s well respected go to contractors. 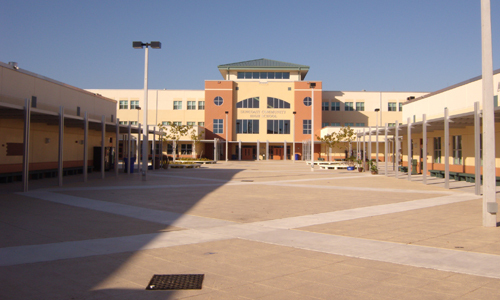 They specialize in architectural concrete flatwork, sidewalk and slip form curbing. Palm Beach Bath and Tennis Club. The project, directed by the architectural firm of Oliver, Glidden, Spina & Partners of West Palm Beach included a complete restoration of the 1926 Urban Designed landmark while keeping it character and original charm intact. The inner courtyard, originally a putting green, was transformed into a garden with the addition of a custom decorative concrete finish to help achieve the look of an old terrazzo finish. The outer beach dining area deck was set on a custom colored "Taby" concrete mix designed to blend in with the natural beach setting. Maschmeyer Concrete has completed numerous custom concrete finishes for private and commercial applications. We can create a custom design mix or help you match an existing project. Maschmeyer has teamed with select contractors that can be recommended to complete your individual projects.